This would make a fantastic gift or make a fantastic gift to any newborn or an addition to the baby bedroom. Washing instructions: Machine OR hand washable at 40 degrees. The top layer is made of cotton with a picture of Snoopy. The backing is a white minky fabric with dots and a polyester batting as the middle layer. Pottery Barn Kids PBK Creamy White Lamb Lovey Baby Sheep Security Blanket ZigZag. Excellent preowned condition Shipped with USPS First Class Package. 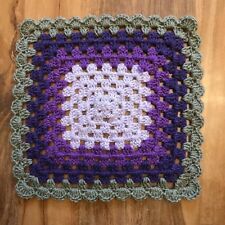 HandMade Crochet COMFORTER Baby Blanket Security Blankie - WHITE 29cm/11.5"
Kellytoy Giraffe Security Blanket Lovey Teether Green Blue Rubber. Excellent preowned condition Rare and hard to find— only one in eBay Shipped with USPS First Class Package. I may inadvertently omit information that you as a collector feel is important. _gsrx_vers_837 (GS 7.0.15 (837)). Graco Ladybug Security Blanket Lovey. Plush ladybug atop a soft blankie. Pink & white 14" square blanket. Features a plush Disney Mickey head. Sorry for the inconvenience, but this is the LAW. Zonkey Zebra. Douglas baby lovey. Graco Baby Security Blanket. Monster or alien red monster head with matching polka print. I love to recycle. Peeking over the top, the playful deer is welcoming precious baby hugs and snuggles. Small Security Blanket Deer - Cloud Island™ Light Pink. Care and Cleaning: Wash Before First Use, Machine wash, cold, Gentle Cycle Wash, Non chlorine bleach when needed, Tumble dry low, Do not iron.